The circumstances are unknown. He was 31 when he died. David Owen Evans is not named on the Trelawnyd War Memorial. 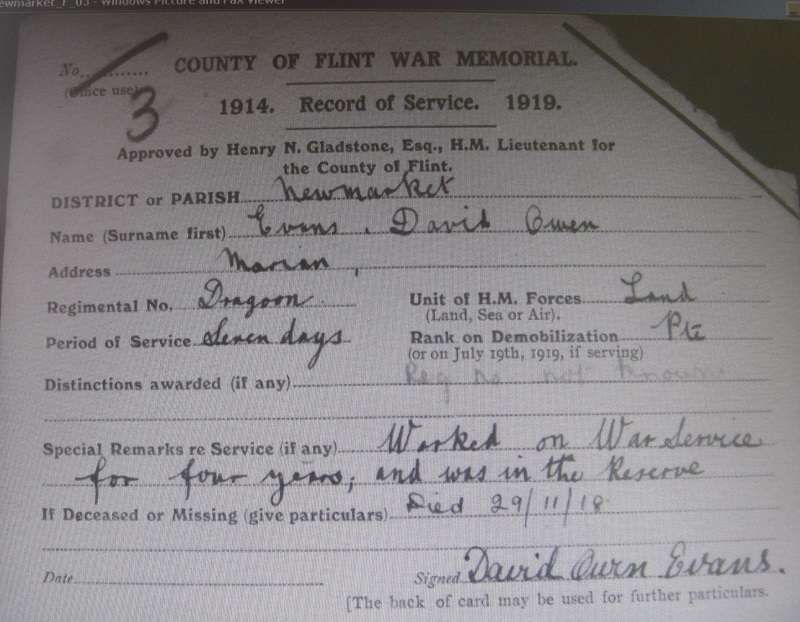 However an index card in the Flintshire Record Office provides a record of his death during the First World War. The following information has been gleaned from the census returns of 1891, 1901 and 1911. David was born in Newmarket in 1887. His father, Robert Evans was a plasterer and when David was 4 the family was living in Park Road, Llandrillo yn Rhos. There were five other tradesmen – mainly plasterers – living in the house. Does this mean they were lodging there? His mother, Elizabeth Anne (nee Parry) was also born in Newmarket as were his siblings Edith Mary and Edwin. In 1901 when David was 14 he was working as a carter on a farm. He, his mother, sister and brother were living in the Marian with his maternal grandmother, Mary Parry, who was described as a ‘farmer’. Edwin’s age at this time was given as 6. Ten years later in 1911 both boys were with their mother in Marian Isa. Their grandmother now probably deceased. Elizabeth stated on the census return that she had had 4 children, 3 of whom were living. Were there two children named Edwin – the second named after his dead brother? According to the index card David served for 4 years before his death. Therefore he must have joined up at the beginning of the war in 1914. I have not been able to trace his service records or even his place of death. The only evidence I have found of his time in the army is in the Register of Soldier’s Effects. Remarkably there are 2 entries for David Evans! The entries show that he was a member of the 6th Reserve Cavalry as well as the Dragoons. Membership of the Dragoons may have been a progression from the 6th Reserve Cavalry as they were affiliated in 1917 when a new 6th Reserve Cavalry was formed. A remark in the Register of Soldier’s Effects suggests that David was discharged from the army. A probate reference for a David Owen Evans exists….. If this is the same man, it states that he left his estate of £177 10s 7d to his widowed mother. The index card is signed by David Owen Evans. Could it be that he signed the card before he died? Did he die as a result of the war? Brother Edwin’s service records are online. He briefly served in the war from December 1915 until he was discharged in April 1916, the reason from discharge being ‘exemption’. Please get in touch with the project if you can add to David Evans’s story.